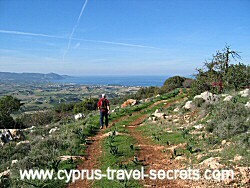 Find out what winter in Cyprus is really like. How often does it rain and what sort of temperatures can you expect. 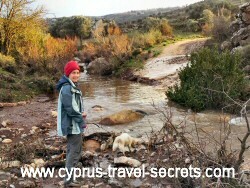 We've now spent 8 winters here on the island and have seen both mild and, by Cypriot standards, harsh winters. While many days are amazingly clear and sunny as you can see in this picture, we often have to endure a lot of heavy rain and extremely cold temperatures, like right now! So I thought I'd share our experiences to let you know exactly what to expect if you're planning a trip during the seasonally quiet months between December and February. January is usually one of the wettest months of the year. I say usually, as we have known completely dry Januarys and very very wet ones too. 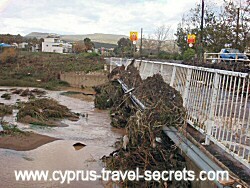 The best way to illustrate winter in Cyprus is to compare the average water flow into the island's reservoirs over the last ten years - the lowest January rainfall was in 2007 when we had just 2.1 million cubic metres (MCM) of water inflow; conversely the wettest was in 2004, when we had a whopping 89.2 MCM - imagine a monsoon with torrential rain for 28 days and you get the picture! If you're interested, you can see the rainfall by month for the last 10 years - expressed as water inflow into the island's reservoirs. Temperatures vary between the norm of around 15 degrees C during the day (on the coast) to as low as 7-8 degrees C, which is normally the coldest night-time temperature. The last few days, we have had VERY cold weather with night-time temperatures dropping to just above zero. Needless to say, the rain on the coast has been snow in the Troodos, so we've had an early start to the Cyprus ski season and winter in Cyprus! Tip: If you plan to drive to Troodos to enjoy the snow, be careful as you can normally only access the ski areas in a 4x4 vehicle after heavy snowfall. We don't have snowploughs here in Cyprus so the roads can be dangerous - I should know as I crashed our old truck into a barrier on black ice doing just 5 miles per hour! Monsoon rains turn roads into rivers! When it rains here, it can be like a monsoon and serious damage can be done to many roads or rather tracks made from compacted gravel. Water finds a channel and then does its best to turn that channel into a river. It even drives its way through concrete as you can see in this picture taken last week (January 2012) - the water completely destroyed the concrete ford. The rain that did the damage above did even more to Latchi harbour on the coast. The sheer force and volume of water torrenting down from the hills ripped out trees and shrubs and carried debris and mud straight into the town. The two bridges in the town were soon blocked with debris, so the filthy muddy water found another way through - straight into the shops, bars and restaurants! This was the result at poor Faros restaurant, a popular haunt for local expats. 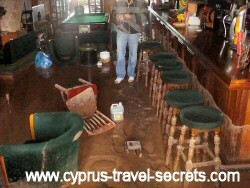 Staff had to work through the night to try to clear the mud and water away and rescue what they could of items stored on floors in the various tavernas and shops. It was a very sad sight in Latchi for several days. This picture shows how close some of the large boats got to being badly damaged. A large chunk of the concrete hard standing on the harbour close to Y and P's taverna completely disappeared, almost taking the Nafsika cruise boat with it. Clean-up work in the tavernas has been completed but the structural damage around the town will take weeks if not months to repair. 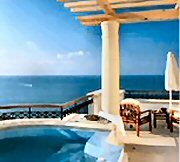 So if you are planning a January winter in Cyprus trip, or you just want to know what it's like to live here during the winter months, I hope my tips will tell you that it can be wet and ugly here. But to illustrate how wonderful it can also be, the temperature changed from 8 degrees two days ago to 17 degrees yesterday - cold, wet and windy one minute to dry warm and sunny the next. The weather can be mad on the island but winter in Cyprus is fun in the sun - just stay away from mountain roads in heavy rain and fire up the woodburner!